Point Line Flow: Souvenirs Maps: Casual Cartographic Encounters and Derivés. Today, whilst venturing to prepare a coffee, I bumped into an object, or, it bumped into me, or my gaze, quietly lying there on the kitchen table, amidst the jars with coffee and sugar and salt and some other spices. The thing in question was an oversized ceramics spoon. On its neck is written 'Sicilia' in capital letters, and in the cavity, against an ultramarine blue background, a hybrid of map and landscape represents the geography of the above mentioned island. All over this small piece of thick paint standing for the big island, small signposts are spread, indicating the names of the major cities and historical localities, accompanied with tiny illustrations of important landmarks or just typical buildings. For example, above a resounding signpost for Etna spears a triangular form of a volcano. Around the mainland, animating the deep blue surface which refers to the Mediterranean Sea, there is a ship, a sailing boat, and a couple of fish. Just off the north-eastern coast, not forgotten, lie three small chunks of land standing for the sublime Aeolian Islands (which, in fact, are eight, but the three shown are actually the biggest ones). The entire landscape map, since it is made of multiple layers of ceramics, produces a relief of valleys and mountains (whose disposition does not, at all, correspond to the real physical features of the terrain). The object in itself is, of course, just a simple souvenir, and was probably a very annoying one for the one who dared to carry it, as fragile as it is, all the way from the sunny island to my snowy hometown. The result of this voyage, besides being a memento of the travels to that magical island, may be of richer consequences to the dwellers of my home, and not only them. A couple of carefully placed features demonstrate the cartographic conscience of the maker of the artefact. In the lower right angle of the head of the spoon, just off the southern coast, the central symbol of Sicilian flag, a medusa head with three legs, called trinacria (a derivation of a symbol of ancient origin – triskelion), is surrounded by four powerful letters – N, E, S, O – standing for north, east, south, west. 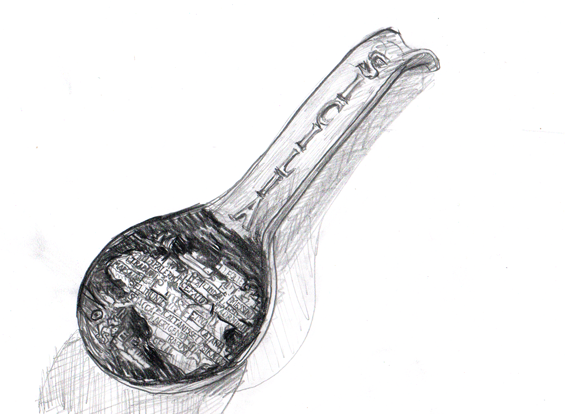 So, the spoon officially claims to be a map. Further, names of the places are disposed over the map with a certain degree of topographic precision (and a bit of poetic freedom), and, interestingly, caring little about the fundamental rules of graphic design: the font and the size of the letters result in masses of names attached one to the other, covering large portions of the terrain. Scarse as it may seem in terms of cartographic design, this organisation of labels, in fact, does convey the most important geographic feature (from the point of view of the spoon-map-maker), that is, where the places stand one in relation to other. The distances and the exact locations are secondary. What is quintessential is, that, if, for example, one is to find her- or himself in Agrigento, if she/he went north-east, she/he would get to Caltanissetta. If she/he were to take off westward by the sea, the path would lead her/him to Sciacca. If she/he proceeded southward along the coast, Gela would cross the path, and so on. The elemental and fundamental information is visualised, the rest is upon the traveller. It is a geography of places, and the relations between them are given, to a certain extent. The simplicity of the design admits that there are myriads of other places and details, waiting to be 'discovered' and explored. The landscape-map provides just the basic palimpsest, but, which eventually, even as rough as it is, may allow one to get ashore onto the island, and have some basic information about where to go (and, even possibly, eat greater amounts of pasta than already substantial Sicilian portions, if she/he were to adopt the spoon to its original purpose). Although maps by definition serve very specific purposes, by their transformation in everyday objects they can become more and less functional, depending on the perspective. Maps, merged with various objects, are still able to effectively influence our spatial epistemologies, maybe, at first glance, imperceptibly. The hybrid things/maps may open unexpected points of view, prospects, and percepts. Where and when we least expect it. Someone is about to cook a lasagna in Provence, and he puts on a map of Britain printed on a chef de cuisine apron. Someone eats lunch in Buenos Aires over a NYC subway map tablecover. Someone walks about Madrid carrying volumes of Italian poetry in a linen tote bag with a Chicago map on it. Someone in Kilburn walks an antique map of Maine printed on his tee shirt. Another map souvenir here and there. These touristic artefacts or designer items are real cartographic devices embodying possible encounters, meet-ups, detours and dérives. These things/maps, the way they are present and the way they present spatial information, are very different from maps as maps such as classic pocket-folded paper maps, large impossible-to-refold road maps, or map apps shining on computer or smartphone screens. Somewhere in between lie grand and regal paper maps which were decorating the walls of our dining rooms for centuries (and, which, for some reason, went out of fashion in the past decades). Just as a reminder, as soon as the modern cartography embraced the modern printing technique, towards the end of the 16th century in the Low Countries, people started living with maps. All social classes, from upper bourgeois merchants to peasants, adornedtheir premises with intricate bundles of lines which represented lands known and unknown. The eyes of these houses' dwellers travelled along these lines every day, passing distractedly over them or scrutinising them point by point. Derivatives of these elaborate prints, lay maps produced and sold today as souvenirs on mugs, plates, clothes, permeate our lives somewhat similarly and differently. These maps are 'souvenirs' etymologically speaking, which is to say tokens of remembrance, mementos, and more than that, actual openings towards other spaces and places, physical bundles of heterogeneous information. Cartographic information they bear does not refer strictly to places represented, these geographic lines and blots, first of all, become presences in our everyday experience, pieces of quotidian perception. The moment of the (visual or haptic) contact between a map souvenir of Paris and someone somewhere else altogether is already a genuine dérive unto itself, or, to follow Foucault, a small heterotopia in act. Maybe it is not very exceptional that someone goes out, say, onto a street of Belgrade Old Town with a map of Marais in mind. In the era of most advanced cartography ever, we shall not forget that maps are not made (just) to control or to navigate. And that the geographic subjects are not always exactly at the pin where the GPS system fixes them. What is it that the souvenir maps may remind (souvient) us of, to which already visited or yet not seen landscapes? What short-circuits of streets, imaginary or fantastic, they may infuse or confuse in our laboriously (mathematically) constructed pyschogeographies? To what paths they may lead us without even realising why and how?